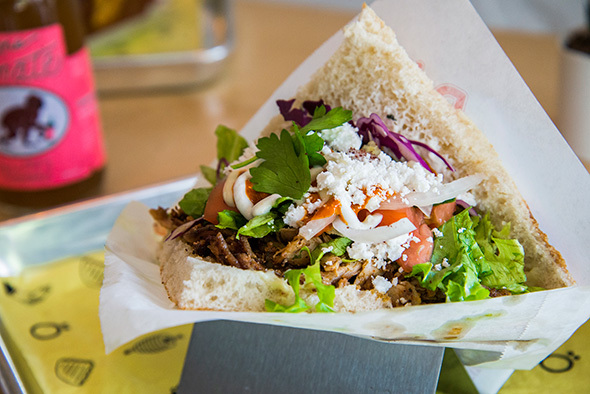 Toronto is home to an astounding variety of sandwiches from around the world. Weather looking for lunch time staples and street foods from across an ocean, or embracing the hand-held specialties of various continents - these sandwiches feature a multi-cultural array of breads, flavours and fillings that couldn't be more diverse or delicious. Here are my picks for the top international sandwiches you'll find in Toronto. Track down the Argentinian food truck, Che for a Choripan, featuring grilled chorizo on a crusty bun dressed with chimichurri, crumbly cheese and fresh salsa. 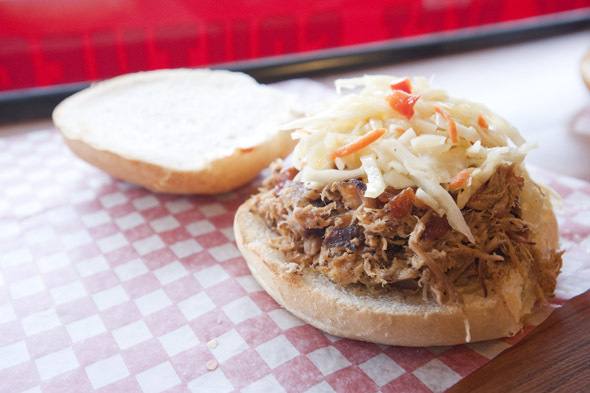 To pick a single sandwich to represent our sprawling neighbours to the south is no easy feat, but I'll give this one to the all mighty pulled pork, a tail-gating specialty for some, an obsession-generating BBQ staple for others. Find a good one in Toronto at one of our city's finest Southern-inspired smokehouses including The Stockyards, Barque, and Holy Smokez). Armenian style pizzas, a.k.a. lahmajoun, make for great sandwiches with a few simple tweaks. Have yours loaded up with cured meats, eggs and fresh toppings then folded into a perfect sandwich at Mamajoun in Scarborough. 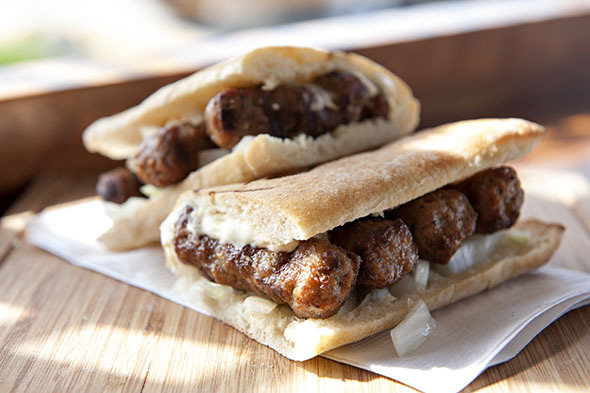 Royals Meats and Big Butcher Barbeque both serve up Chevaps, a Balkan specialty featuring beef and lamb meat rolls traditionally served on a served on a lepinya bun with kajmak, a cream cheese-like sauce. 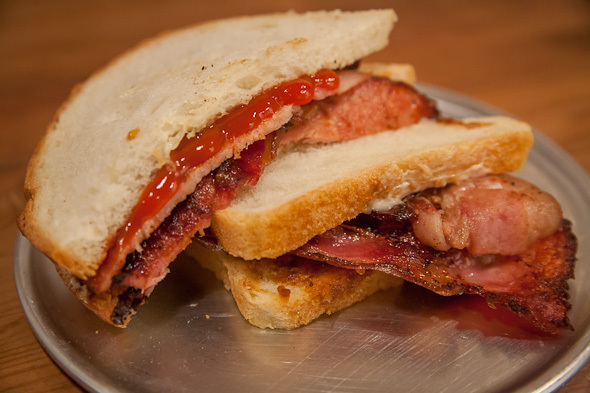 Rashers in Leslieville is a sandwich shop devoted to all thing bacon, and here you'll find the Bacon Butty, a sandwich layered with bacon rashers and brown sauce on buttered slices of soft white bread. 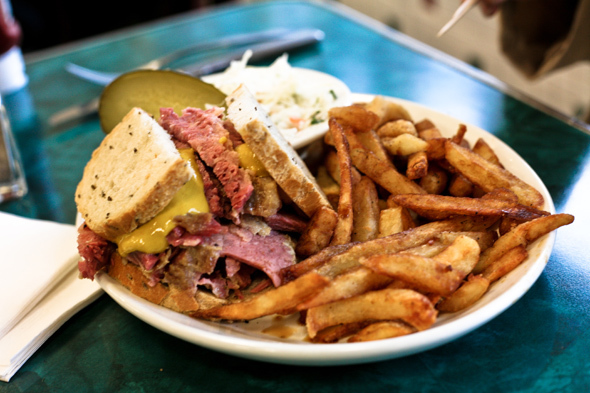 Is the Montreal smoked meat more famous than Hogtown's peameal on a bun? Probably. Hit up a Jewish deli like Centre Street Deli or Caplansky's to find a sky-high pile of hand-carved Smoked Meat slathered with mustard and sandwiched between slices of rye. 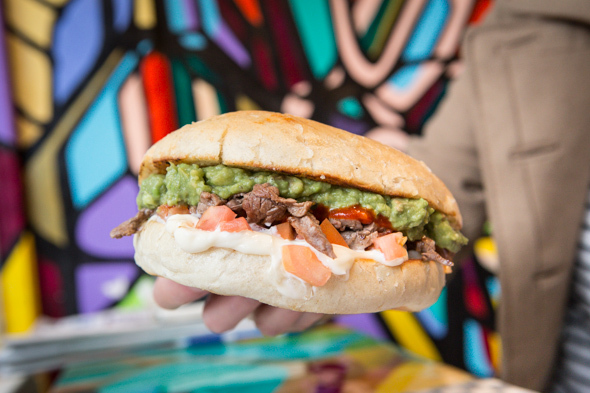 Completo is the place to get a Churrasco, a classic Chilean street sandwich containing thin slices of griddled steak (or pork or chorizo sausage) dressed with mayo, diced tomatoes, mashed avocado, house hot sauce and roasted red pepper sauce on a toasted bun. 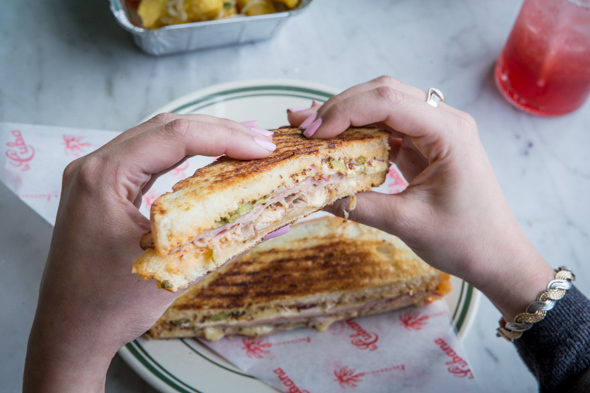 La Cubana is a restaurant devoted to Cuban comfort foods and the thinly pressed Cuban sandwich layered with ham, pork, gruyere, red onions, cornichons and grainy mustard and mayo is house favourite. A Croque Monsieur is a cafe favourite in both Paris and Toronto and can be distinguished as the only sandwich on this list that requires a fork and a knife. Head to The Tempered Room or Maman for very good instances of ham and cheese sandwich smothered in bechamel. Otto's Berlin Doner in Kensington Market slings Doner Kebabs, the famous street food found throughout Turkey and Germany. The sandwiches are built on a wedge of fladenbrot and filled with a choice of chicken, veal and lamb, fried halloumi, or veggies then doused with yogurt sauce and hot sauce, and finished with red cabbage, chopped cucumbers, tomatoes, onions and lettuce. Gyro and souvlaki are stars on the menu at any one of Toronto's Greek grills (try Messini, It's All GRK, or Square Boy) where skewered or shaved meats are nestled into puffy pita and dressed with tzatiki, chopped tomatoes and onions... maybe a few French fries or a sprinkling of feta. Schnitzel Queen in Corktown bills an extensive selection of schnitzel sandwiches loaded with breaded pork or chicken and dressed with fried onions, sauerkraut and potato salad. Pau are popular components in Indian fast foods like vada-pau, pau-bhaji, burji-pau, but here in Toronto you'll find them used as the base for the sweat-inducing Kerala chili beef fry sandwich at the Indian Street Food Co..
Iranian cafe, Kad Banu does Nan O Paneer, nan sandwiches stuffed with sheeps milk cheese, cucumber, tomato, fresh mint and basil. 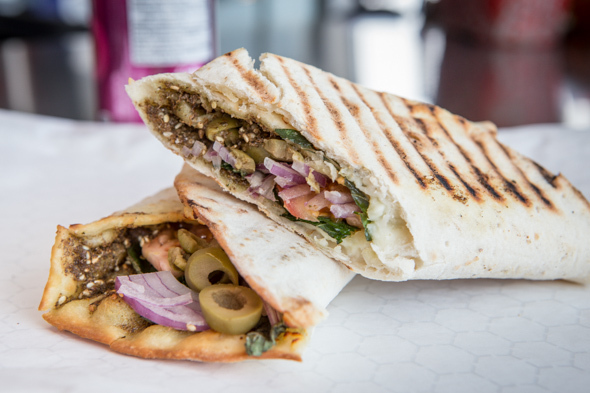 Sabich is an Iraqi-Israeli sandwich featuring fried eggplant, hard boiled eggs, hummus, tahini, hot sauce and fresh and pickled veggies packed into a pita pocket or nestled into fresh laffa. Find it on the menus at Dr. Laffa and Famous Laffa. 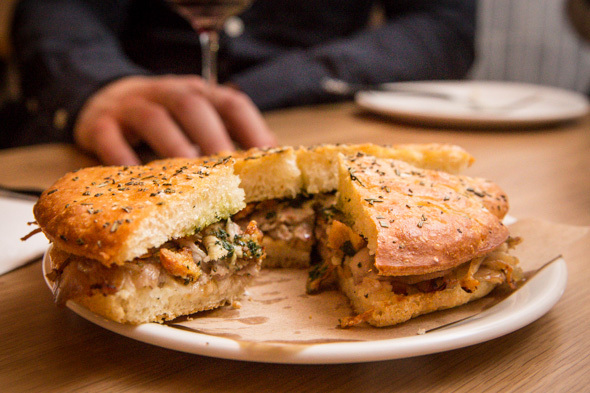 Schiacciata, or stuffed focaccia at Bar Buca comes filled with things like pistachio mortadella, green tomatoes, stracchino, pesto or spicy smoked calabrese sausage, rapini and stracciatella cheese. 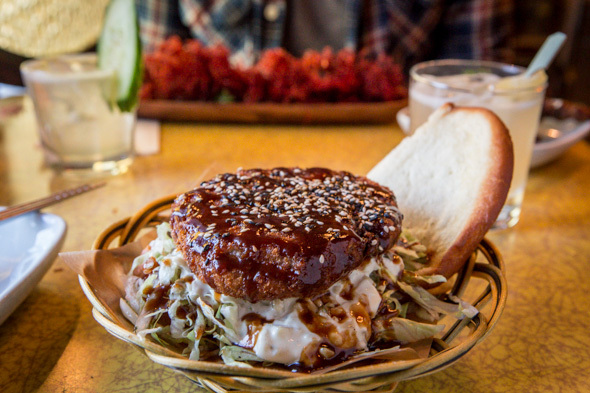 Katsu sandos is aren't quite as readily available in Toronto as they are in Japan, but you'll still find an excellent rendition at HanMoto, where the Katsu Bun ($7) is loaded with a round slab of pork belly crusted in panko, deep fried, glazed in miso and sprinkled with sesame seeds. Tenoch on St. Clair does this tortas on a Telera bun stuffed with tomatoes onions, beans, avocado, cheese and a choice of meaty fillings including ham and egg, breaded steak, shredded roast pork, or a combination of all these and more. 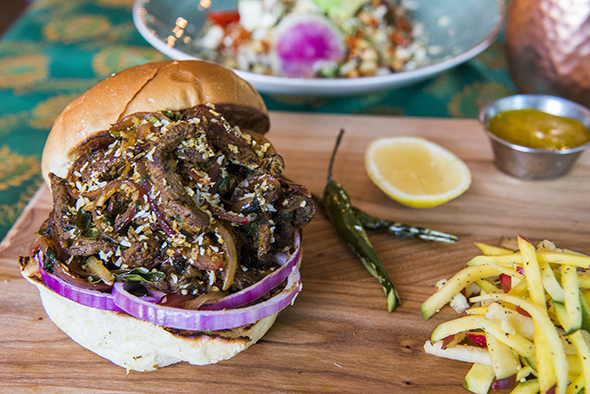 Head to Zeerah in Mississauga to find the the family-run fast food joint slinging bun kebab, typical of street vendors in Karachi. Less than $5 will buy you a soft bun loaded with a choice of chicken, beef, lentils or potato kabab and dressed with spicy chutney, onion and tomato. 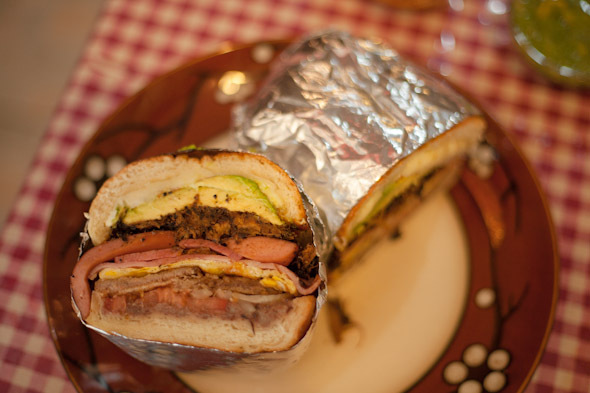 Butifarra is a Peruvian sandwich you can mow down on at at Pisco 1641 in Little Italy. Here you'll find it built on French bread with Jamon del Pais, salsa criolla (pickled onions) and citrus mayo. 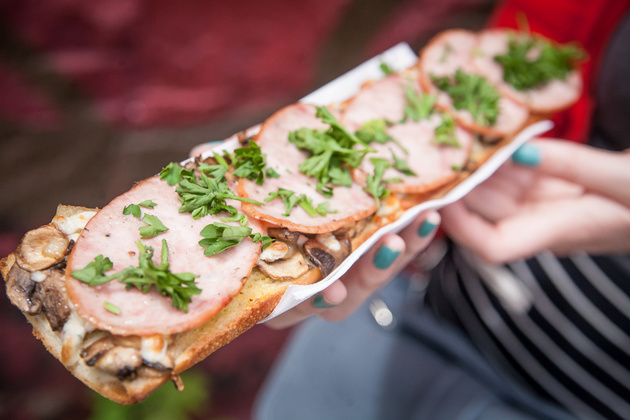 Zapiekanka, the long, open faced Polish baguette sandwiches topped with things like mushrooms, melted cheese, kraut and pickles are the specialty of Toasty Zappi, a mobile kitchen you'll find at street festivals and events throughout the summer. 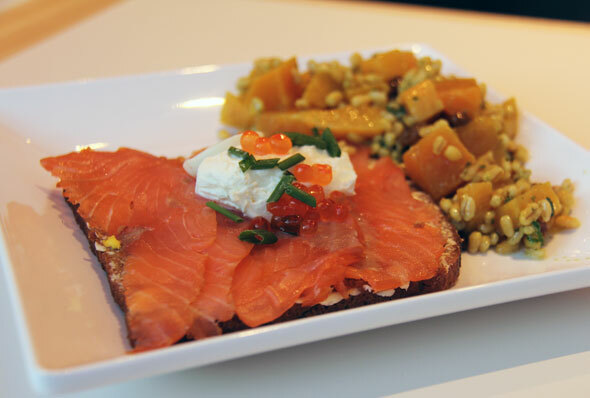 Karelia Kitchen has got Smorrebrod, open faced sandwiches on its menu layered with things like baby shrimp, lemon aioli, hard boiled duck egg, dill and pea shoots, or smoked salmon with fresh cheese, lemon zest, salmon roe, quail egg, capers and dill. Enjoy a bocadillo along with a spread of tapas at Bar Raval where the Spanish snack bar stacks sandwiches high with thick slabs of adobo-sauced pork. Gua bao might be the quintessential snack food of Taiwan but Torontonians will devour them with equal enthusiasm. 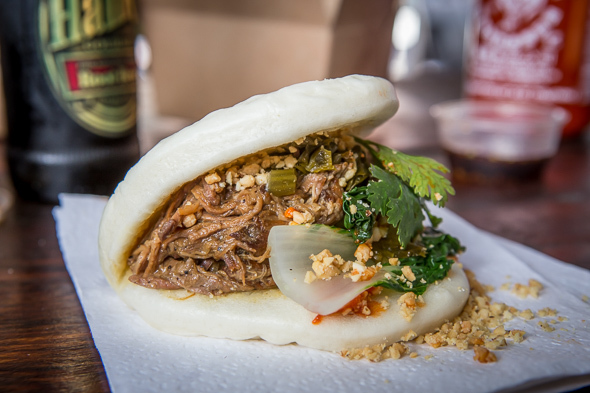 Head to Mean Bao, Momofuku, and Mii Sandwich Co. to find the pillowy steamed buns folded around things like pork belly, jerk chicken, and bulgogi beef. Arepa Cafe and El Arepazo are top spots to find Arepa, maize pockets stuffed with things like queso and avocado, chorizo, plantains, or roasted pork. Banh Mi built on crusty French baguettes slathered with pate and cold cuts or loaded with pork belly, grilled or fried meats have become fixtures at lunch counters city wide. 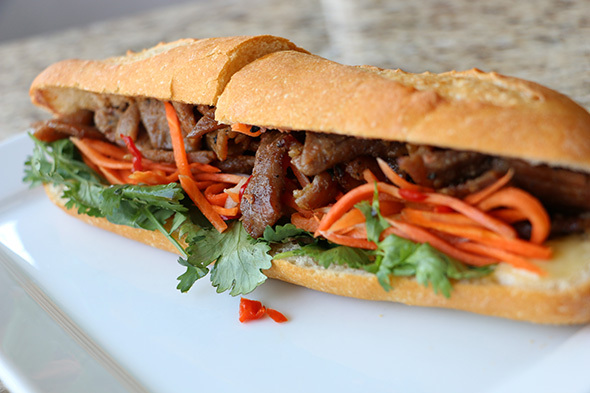 Find good ones at Banh Mi Boys, Baguette & Co., and Rose's Vietnamese Sandwiches. Lead photo of Che by Jesse Milns. What did I miss? Add your favourite international sandwiches to the comments.